Looking to super-charge your kitchen's design credentials? Hanging wallpaper in a kitchen is an unusual move, but it's a hot trend for the year(s) ahead, is easy and cheap to do, and it will give your kitchen a homely, distinctive feel that you can't achieve with paint. In fact, we thinking putting wallpaper in a kitchen makes the perfect weekend project. A word before you start: if you're not going to choose a wipeable design that's specifically designed for kitchens/bathroom, you'll need to either protect the wallpaper with a glass splashback or hang the wallpaper only in areas where it won't be exposed to constant splashing or heat. Ready to go? Why not use these kitchen wallpaper design ideas to inspire your easy kitchen transformation? Find more inspiration and advice for planning, designing and costing your new kitchen in our ultimate guide. Picking out a kitchen wallpaper that highlights the fittings in the room can give the whole scheme cohesion it might have lacked before. Here, the wallpaper design complements the worktops, light fittings, taps and the hob to create a co-ordinated look. The green wall acts as a bold contrast that further enlivens the scheme. Find more beautiful botanical wallpapers in our design gallery. Wallpaper shown by Little Greene. If yours is an open plan kitchen diner and living space, it's likely that you'll want the entire room to feel more like a living area than one that's purely functional – and wallpaper is the ideal medium to use to bridge the gap between the two areas. Hanging a design on a kitchen wall that echoes the colour or pattern of your dining chairs is an easy way to create a visual link between the two zones. Find out more about how to design an open plan kitchen diner and living space. Wallpaper shown by Farrow & Ball. In an ideal world, the wallpaper you choose for your kitchen won't fight for attention with the rest of the cabinetry but will complement it. So, if you've spent ages hunting down the best kitchen worktop types (whether marble, wood or a man made material), you'll want to ensure it's not over-shadowed by additional decorative details. Here, the design by Sandberg is the perfect tonal match for the beautiful wooden worktops. If you'd rather keep the kitchen area fuss-free within an open-plan space, putting wallpaper within the dining area can define the zone effectively while giving what would otherwise be a plain space bags of character. Mixing and matching different patterns and prints is an art – use our guide to find out how. Find more inspiration in our traditional dining room design ideas gallery. Wallpaper shown by Little Greene. Shaker style kitchen designs are a popular choice – and with good reason, since they never date and are so easy to decorate around. What's more, they will suit both contemporary and traditional homes. Matching them with a wallpaper design that really suits the simple spirit of Shaker style is the best route. Here, the pretty design by Sandberg has subtly bright colours to enliven the grey kitchen. Love grey? Find more grey kitchen design ideas in our gallery. Open shelves are a must-have in an informal kitchen – the perfect place to store and display kitchenware. Wallpapering the wall behind open shelves will draw attention to any attractive items on display, and add depth and character to that part of the kitchen. Our advice? Put wallpaper on just one or two walls in a kitchen – more than that might well be too busy, especially if you're designing a small kitchen. Check out these feature wall design ideas to inspire your scheme. Wallpaper shown by Farrow & Ball. You can up the effect of a dramatic wallpaper design by painting woodwork in a bold shade that picks out the wallpaper's deepest colour. Perfect for period-style properties and contemporary transformations, it's a modern trend that harks back to Victorian times and beyond. Find more interior design advice for your kitchen in our expert guide. There's sooo much to love about this dining nook: the panelling and the geometric wallpaper create a space for eating and entertaining that's both practical, good looking and intimate. Use our wall panelling design ideas and advice to create a similar look at home – and check out our favourite geometric wallpaper designs in our gallery. Wallpaper shown by Sandberg. If you're looking to create a kitchen transformation that creates a soothing atmosphere perfect for a busy family space, pick a neutral-toned kitchen wallpaper that complements the cabinetry. That needn't mean plain – an intricate design will still create lots of interest. On that note, bear in mind that a small/intricate print will look more traditional and have more of a country cottage appeal than one with a large repeat print, which will create a more formal or contemporary finish. Use these tips for designing a room with patterned wallpaper to get the best result. 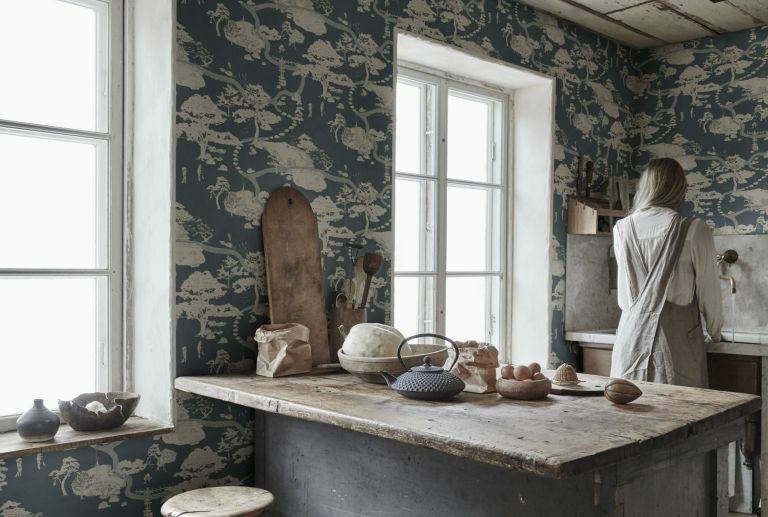 If your kitchen is in a former living room or a characterful period home, it's likely that it has architectural features that can be highlighted with wallpaper. Think alcoves, like the one above or a chimney breast. Love this look? Find Arts & Crafts room design ideas to find more inspiration. The wallpaper in this dining space manages a neat visual trick – linking it to the next room with tones of blue. Why link different rooms within a house? Creating a cohesive scheme throughout by picking different tones of the same colour – or the same tone of different colours – makes for a smart finish, and can work to make a small hose feel larger, too. Wallpapering the back of shelves with different colourways of the same design is a clever trick to get a cute country cottage look and to show off your prettiest kitchenware. If you go for this look, keep the rest of the scheme – cabinetry and all – neutral and fuss-free. Wallpapers shown by Vanessa Arbuthnott. If you've inherited a white kitchen that's otherwise lacking in detail – or if you just like to change up the look of a room every couple of years – swapping plain walls for wallpapered ones can give the space a quick, affordable update. Going for an intricate print over a large area of the room? Keep details such as window treatments simple – shutters are perfect. Find more inspiring white kitchen design ideas to get your scheme started. Perhaps you've inherited a black kitchen and want to take it from cold and contemporary to vintage-style? Panelling the walls to dado level and painting it in black or a muddy neutral shade, then contrasting it with a light-coloured, pretty wallpaper above can transform it quickly – and at a far lower cost than swapping cabinet doors or replacing the kitchen entirely. Use our guide to designing a vintage kitchen to be inspired to create this look. This contemporary style utility room is the perfect example of how you can be braver with your wallpaper choice in a small, seldom seen space than you might in the kitchen or a reception room. As well as giving utility rooms this treatment, think cloakrooms, too. Find out how to plan and design the perfect utility room in our guide.